Gay parenthood has almost worked its way into being a version of the norm. Disney Channel programs now have gay parents making guest appearances on their sitcoms, Modern Family brought it to television across the globe and the Daley-Lance Bass’ are doing the MOST to publicise their new-born. It seems to always be a guest appearance, a subplot or an entertainment story on page 7. No Kids brings the issue of gay parenting centre-stage. 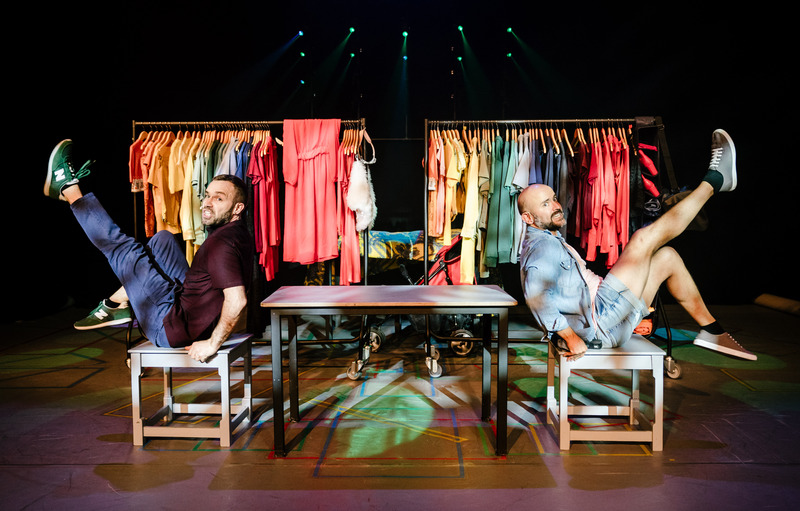 We meet real-life George Mann and Nir Paldi, co-Artistic Directors of Theatre Ad Infinitum, working on developing their latest theatrical production, their first go at putting together a theatrical work together. They settle on working through the topic of having kids; to parent, or not to parent? It’s the burning question facing most gay men in a long-term committed relationship, and Man and Paldi had rolled up their sleeves ready to toil with the in’s and out’s of queer parenthood. 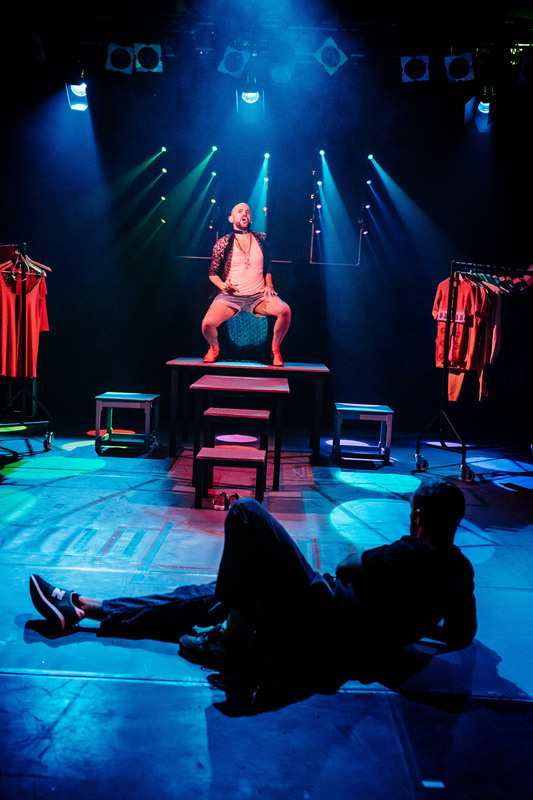 Side-stepping the eye-rolling pink kitchen-sink drama that audience have come to expect in gay theatre production, rather than being sickly melodramatic, this production is a multi-faceted meditation on the issue. This theatrical tapestry of intermingling narrative threads, both recollected and imagined, brings out the head-aching intricacy of this issue, all packed into a bustling, dynamic 70-minute show. The writing is intriguing, seamlessly melding in and out of scenes, characters and scenarios without running the risk of confusing an audience. Throughout the production, you’re taken from adoption interview, the office of their imagined child’s headmaster, to their own childhood homes without enduring lull in the plays mile-a-minute progression. What this piece has a hearty supply of is familiarity with the subject matter, which brings something uniquely authentic to the stage. Man and Paldi are themselves, working through real arguments that they have or will have, and their on-stage frustrations with each other ring true to anyone who has faced a deal-breaking issue in a relationship. The show varies in tone, going from unbridled joy to boundless cynicism on the issue in a few breaths which have you unsure what you’re supposed to be feeling. The coming moments occasionally create friction with the work’s darker subject matter, and an eyebrow must be raised in a production that looks to Madonna songs to add emotional depth. But this is a show about real gay men in their late 30’s; OF COURSE there’s going to be some Madonna. Despite some less successful sequences, No Kids is truly packed to the brim with vigour and has an audience thinking in-depth about the greater implications of parenthood. If you have yet to consider having children, regardless of your sexuality, this production will have you mulling it over on the train home. No Kids is running at the Battersea Arts Centre, Lavender Hill, London SW11 5TN until the 23rdof February. For your tickets, head over to BAC.org.uk. The post No Kids review – bringing the issue of gay parenting centre-stage appeared first on QX Magazine. What is ghosting and why does it happen?